We've always known, and said, that money is usually the downfall of the Far Right: Shortage of it, Fraudulent use of it, or Arguments over it. With Marine Le Pen's Front National, it seems to be the first option. They're basically broke - and this is supposed to be the most successful Far Right Party in Europe. 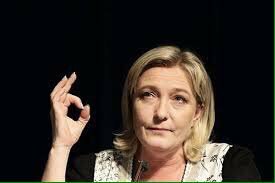 Marine Le Pen shows us how much cash her Party has left. Right now they need €25m to fight upcoming elections, and they just don't have it. And they can't get it using *cough* previous means, especially after being raided by French and Belgian Fraud Squad officers in February - they're under very close scrutiny right now, which means no scooping up excess EU salaries and allowances for National Politics, which is also a much-favoured Ukip trick, by the way. And that massive €9m loan they got from Vladimir Putin's friend? (after Le Pen's support for Russian actions in the Crimea) - they can't pay that back, either. Being in debt to Russians is never a good thing. Seems that FN were banking (excuse the pun) on winning more power and seats in the last election for funding. That didn't happen. Now they're trawling the begging bowl around Paris - asking for loans from no less than 45 different banks, as their regular money-men Société Générale have been luke-warm in their response for more cash. Le Pen might even have to go back to the Russians. And of course, they'll want nothing in return, will they? 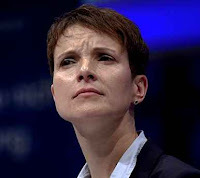 Strangely enough, on the same day, yet another story about Fascism and Money : German Far-Right AFD leader Frauke Petry is under investigation for perjury over statements on her Party's Funding.